Nathan Robbins has a hard time going out but when he meets the girl next door his life is changed for the better, that is until his inner darkness consumes him. Now Nathan is not alone no one is safe. Adam Dillon returns as Nathan Robbins who we had previously met in Mj Dixon's 'SLASHER HOUSE'. Nathan suffers from agoraphobia and due to this his interactions with the outside world are limited to the delivery man bringing his shopping. His days are spent doing the same things at certain times everyday until Isabelle Carter (Becca Talulah) moves into his building and they become firm friends. His life now seeming changed for the better has Nathan excited that is until something takes a hold of him and turns this happy event in his life upside down. Nicholas Vince (Chatterer Cenobite in 'HELLRAISER') plays Detective James Miller, who knows what Nathan has done but wants him to confess his crimes. We see Nathan tell his story within a police interview room and cutting between his apartment building. This helps keep the whole film flowing really well and the way Adam Dillon plays his character makes you feel sympathy for his agoraphobic ways, he was also one of the more enjoyable characters in 'SLASHER HOUSE' alongside Thorn, who you can see in 'LEGACY OF THORN'. Come take a trip on the dark side of the mind with 'HOLLOWER'. 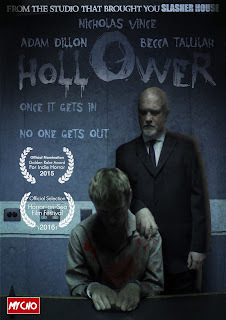 Get your own copy of 'HOLLOWER' direct from Mycho Entertainment here.